From minutely archiving even the most obscure of literature to making sense of a seemingly insurmountable throve of writings, scores and images, public libraries fulfil an invaluable, and very necessary, role in modern society, one which ensures longevity and contemporary relevance to, quite literally, all types of subjects – from colonial history and botanical artefacts to early feminist texts and curatorial catalogues. On the other hand, the Internet and its “let me Wiki that for you” culture have challenged public libraries’ supremacies head on, forcing those with ambitions for the future to radically rethink their very nature and approach, often making good use of technology – advanced searches, apps and data walls – along the way. Here, we pay tribute to some of the country’s most distinct and distinguished ones in the hope of encouraging you to renew your membership once and for all. Nestled in a narrow street in the heart of Matongé, the Lumumba Library is an anomaly, to say the least, in the Belgian library landscape. The result of a very personal passion by philosophy and philology graduate Philip Buyck, it was his move to the neighbourhood back in 2005 that initially sparked his interest in Congo. “I started reading and assembling everything I could find on the subject. Brussels is a gold mine in this respect,” says Philip. Over a decade later, he’s created an impressive collection that goes beyond books to also include magazines, films and artworks stemming from flea markets, second-hand shops and even donations from private archives. While the focus clearly lies on Patrice Lumumba, the first Prime Minister of the newly independent Democratic Republic of Congo, the library also holds numerous publications on the country as a whole, with a special emphasis on its (de-)colonisation. Its shelves are veritable treasure troves of a bygone era. Think first editions by Henry Morton Stanley – the infamous 19th century Congo explorer – or an early biography of a young Mobutu complete with handwritten personal dedication to a friend. As Belgium’s involvement in Congo remains a touchy subject, Philip decided to forego government subsidies in favour of independence. “I need to ensure that the Belgian government doesn’t try to shape the narrative,” he explains. 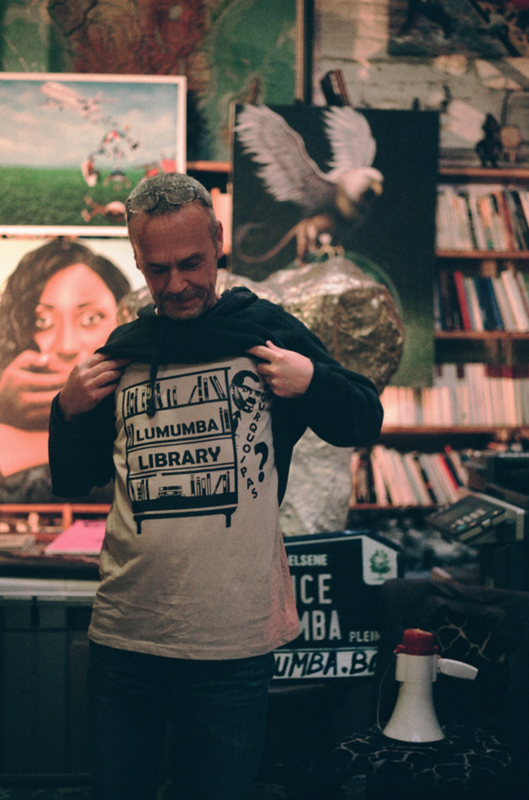 Further proof of his commitment to the cause, the library often organises concerts and exhibitions of Congolese musicians and artists in the neighbourhood’s many colourful bars. “I see myself as a kind of social sculpture. A conceptual art piece in the sense of Joseph Beuys, who placed this subject at the forefront, bit by bit every day,” Philip concludes. With over 15,000 titles generously stretched out over two floors, Muntpunt’s all-encompassing scope includes economics, political science, psychology, sociology, anthropology, history, philosophy, religion, education and many more, its stated aim being to appeal to as wide an audience as possible through a carefully-curated selection of books, magazines and DVDs. Above and beyond its mission to empower the city’s population through knowledge, it also aims to improve city life, not least through its programme of visually-augmented mini-libraries. Take, for instance, its Slow Living collection that gathers over a thousand books around the subject of mindfulness, alternative economies and ecology, a curatorial approach based on the argument that social structures focussing on spiritual riches make people calmer, healthier and happier. Another is The City, collating everything you would want to know on city development, socio-geographic urbanity and urban gardening. “Well-being and cohesive social living in a cosmopolitan city is our major focus in general, and using the traditional knowledge of the social sciences, we try to provide answers to present-day questions,” explains Gertrude Van de Perre, a member of Muntpunt’s curatorial team. A clear highlight is their Brussels collection, a treasure trove of 3,000 books dissecting the European capital from a myriad of different perspectives, ranging from history and art to architecture and fiction. At its peak, La Médiathèque rented out over a million CDs, computer games and movies a year to Brussels locals. The onslaught of the digital age brought this to a screeching halt, forcing the beloved institution to up its game or risk irrelevance. Fast forward a few years, and the outlook is now resolutely a more global one, not least in the name chosen for the new venture: PointCulture. “Our goal is to make cultural creations accessible in the broader sense,” explains Jean-Grégoire Muller, who oversees the Brussels branch. “We’re constantly looking for alternative formulas linked to music and cinema,” he continues. Indeed, the library regularly hosts exhibitions, conferences and film screenings whilst also being behind the phenomenally underrated app Belgium Underground, a near-exhaustive map-centred journey through Belgium’s lesser-known, more experimental music scenes. Since its move to a new location in the Botanique district four years ago, it now also plays host to a café, whilst its library rooms have recently undergone something of a makeover. Going the extra miles in terms of curating, employees often put their personal favourites forward, the in-house Archipel project organises CDs according to themes and homegrown talent is distinguished thanks to a dedicated badge. And although the collection of about 328,000 pieces keeps on growing, its pace has slowed down of late: “20 years ago, we would purchase most of the pieces – but now we need to be more selective, choosing what’s pertinent to each genre,” says Jean-Grégoire. Brussels’ RoSa library, which specialises in feminism and gender studies, is the result of a private initiative by psychologist and publicist Renée Van Mechelen who was heavily involved in the 70s’ second wave of feminism. Back then, many books, magazines, pamphlets and studies were being published on the subject, and having written books on the matter herself, Renée had the idea to create a centre collecting them all. So, in 1978, RoSa – short for “Role and Society” – saw the light of day, and today boasts one of the largest European archives on feminism of its kind. Indeed, what began with donations from women’s organisations and private archives is now a major collection of about 30,000 items, including rarities from the first feminist wave of 1860, as well as posters and flyers from the Belgium abortion movement of the early 90s. While most publications are of an academic nature, readers can also find more accessible and contemporary pop-culture magazines such as Girls Like Us. Overall, the vast collection touches upon all kinds of women’s issues: from violence and sustainable development to education and art. “Feminism has once again become a hot topic, maybe more so than ever, and we definitely see this ourselves here at RoSa,” says library employee Carine Tavernier. “Lots of people now want to know its entire history, and we’re also seeing a rising interest in Muslim feminism too.” And, in a bid to stay up to date with current thoughts and thinking around feminism, the staff often attend conferences and workshops themselves, ensuring it can fulfil its clientele’s growing thirst for knowledge. “We want to offer more than just a catalogue. We’re here to guide people and help them further themselves,” adds staff employee Christin Ho. At times when many libraries struggle to stay relevant, Ghent’s De Krook is an unexpected success story – and not only for its internationally-recognised architecture, the subject of numerous design magazine spreads the world over. While the former library on the corner of Woodrow Wilsonplein clocked in close to 2,000 visitors a day, the number has now risen to a staggering 8,000 a day since the move one year ago. “Last year was the first time when loans increased again,” says De Krook’s Nathalie De Neve, a fact attributed to the library’s commitment to new technologies. “It’s a physical library that invests in digital information,” Nathalie goes on. Here, the focus is squarely on education in every sense of the word. “Our aim is to help people understand the world,” she continues, pointing to its substantial programme of lectures, debates and study advice as evidence of its commitment. Other standout features include a study room that boasts a capacity of 1,500 on the top floor, a data wall projecting recent research collated from Ghent University as well as a string of touch screens available throughout, allowing users direct access to De Krook’s in-house catalogue as well as its very own Wikipedia, known as Dossiers. Written by the librarians themselves, these introduce specific subjects, compiling all kinds of related reading suggestions. A “most popular” functionality categorised by age and gender, as well as an app and tagging system that allows for an entirely automated lend-and-return service further evidence this library’s resolutely new age ambitions. In the fall of 2017, contemporary art museum S.M.A.K., Design Museum Gent and local art schools KASK and HISK joined forces to unite their collections of books under one roof, in a restored medieval building on the Bijloke site. While this bewildering offer of art publications is reason enough for a visit, the newly founded Art Library also includes the full private collection of Karel Geirlandt, who as the chairman of VMHK (Vereniging voor het Museum van Hedendaagse Kunst) played a major role in the foundation of S.M.A.K. “It’s a very special collection, which is why we gave it its own dedicated space instead of integrating it into the other shelves,” explains librarian Suzy Castermans. “Unlike the other collections, the Karel pieces can’t be taken home. Many of them are too valuable and rare.” The 35,000 publications spread out across 241 metres of shelving not only incorporate the biggest compilation of artists’ books in Belgium, they also provide an incredibly detailed selection of exhibition catalogues, especially between the 60s and 90s, all classified either by city and institution and many of which are almost impossible to find these days – think prints courtesy of Sol LeWitt or Stanley Brouwn. Leuven’s MATRIX library is dedicated to providing documentation and education on contemporary classical music. “A lot of people find that classical music after 1950 has become incomprehensible. We want to show that this is not the case,” explains librarian Melissa Portaels, who studied at the closely-affiliated musicology department at KU Leuven. “Our offer is so unique and specialised that we’ve never had problems in attracting visitors,” she adds. Understandably, most are researchers, musicians or musicology students who come to MATRIX to study from more than 25,000 scores, which make up the core of MATRIX’s rare collection, with a majority by Belgian composers. “Many send us their scores because it’s important for them to be present in our library,” Melissa says. In addition to its archive of scores, MATRIX also owns a multitude of recordings, academic literature, music history, sociology as well as philosophy books, mostly in English and Flemish, but also in Italian or German in a few instances. “From our point of view, it’s essential to build a collection that matches and supports the University’s research efforts,” concludes Melissa. When paying them a visit, make sure not to miss the numerous graphic scores created using visual symbols instead of traditional notation. With its enormous collection of 300,000 books, journals, illustrations, photographs, periodicals and more, the library located in Meise’s botanical garden is hands down one of the best of its kind in Europe. While a big part of the collection is in English, older publications are often in German with others even in Italian, Chinese, or Portuguese. Initially the result of private efforts in the 19th century, it was eventually bought up by the state in 1870. Today, the garden’s team of about 30 botanical researchers add roughly 700 publications to its already extensive collection each year in a bid to remain up-to-date. “Our mission is to conserve and enrich documentation on plants and make it accessible for everyone,” explains Régine Fabri, a trained botanist and chief librarian, who goes on to say that “the collection mainly evolves around the identification of plants – their botanical history – but also medical use, agriculture, horticulture and the likes.” What’s probably most exceptional are the ancient books featuring vegetal prints, meaning the images aren’t actually illustrations but rather real-life plants, all making for unique pieces. Also highly intriguing are the records of correspondence between the library’s former directors. “You can follow the whole thought process of how one of them turned away from creationism towards Darwinism,” Régine recalls, evidently fascinated. Visitors range from specialists, students and researchers to gardeners and hobby botanists, with requests coming in all shapes and forms. “A lawyer dealing with a neighbourly dispute about a plant came by to research its cultivation, while a poison centre contacted us when a child ate a strange fruit to find out whether it’s toxic or not,” Régine concludes.